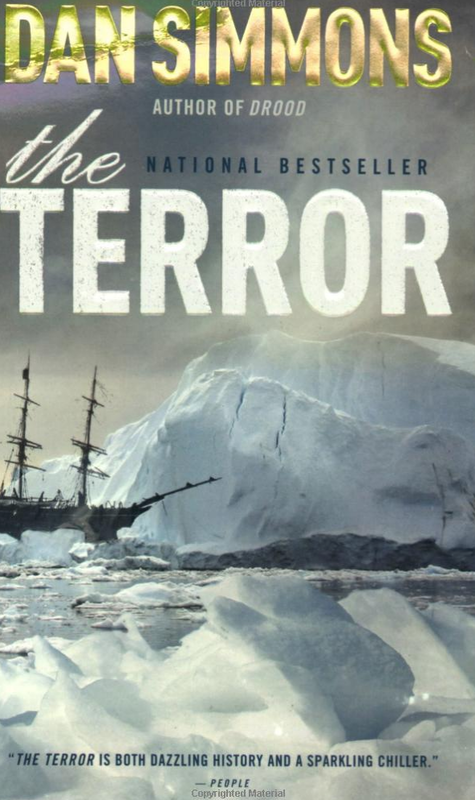 The Terror by Dan Simmons tells the bleak, brutal tale of the doomed 1845 Franklin Expedition in which the HMS Terror and HMS Erebus sought to traverse the Northwest Passage. While historically we know that all those on the expedition perished likely from starvation, exposure, scurvy, cannibalism, etc, Simmons offers a horror/supernatural twist to this epic historical fiction tome. But perhaps the greatest foe of Simmons’ cast of doomed characters is The Thing. The men call it that, as the creature doesn’t really get a true name or explanation until the end of the book. The Thing is a huge, supernatural bear-like creature that materializes and disappears without a moment’s notice. Stuck in the ice for nearly two years, the expedition’s men become sitting ducks to this creature. While at first many think it is just a very large polar bear, they soon come to find they are dealing with something much darker and intelligent. The creature decapitates, rips out spinal cords, and returns body parts to the ships like taunting warnings. No bullet or knife can harm this creature, and so the men are at its mercy, as well as at the mercy as their harsh environment and situation. The cast of characters rotates every chapter, each time the crew is picked off one by one–sometimes before we even have the chance to get to know them. The thing about this novel is that the reader knows going in that everyone dies. I suppose it’s quite morbid and depressing to commit to reading 900some pages of death and brutality, but there it is! The heart of the novel is Captain Crozier, captain of the HMS Terror. Crozier is a complex character in that he’s an alcoholic who funnily enough seems to be one of the only reasonable and realistic men among both crews (Dr. Goodsir and a few others as well.) Simmons’ twist on Crozier is that the Irishman has had a second-sight or psychic ability since a very young age. We’re not introduced to his gift, however, until after he runs out of whiskey. The other most interesting character is Lady Silence, an Inuit (referred to as Eskimaux in the book) woman the crew comes across around the same time as their first encounter with The Thing. The men quickly come to find that Silence’s tongue is gone and she has seemingly been separated from her village or party. Silence lives aboard HMS Terror for a time, an object of fascination to a few, but considered a witch by others. Many think Silence is the cause of their troubles with The Thing, which is to be expected from 19th century Englishmen afraid of the other. The Terror is a marathon of bleakness and brutality, and by the end the reader will wind up in places she never expected. The novel goes from heavy historical fiction, to survival tale, and slowly transitions to full supernatural. Simmons delves into Inuit mythology near the end, which I did look up after. From what I found, in addition to another review I saw online, apparently Simmons made up a specific Inuit myth just for this book. I’m not sure how I feel about that…I suppose I would have preferred he’d used an existing myth. That said, it is evident that the author did his research regarding Inuit customs, dress, culture, language, etc. which was interesting to learn about. The only thing I wasn’t completely sold on (I could suspend my disbelief for The Thing!) was an unexpected relationship that forms near the end of the novel. For most of the book Crozier thinks of Lady Silence as little more than a “native wench” who could possibly be used as a tool for the men’s survival. But later, however, his view changes drastically. I’m not sure I fully understood their relationship in the context of this story, or the why of it given how these character perviously treated each other, but I suppose Simmons wants the reader to chalk it up to their supernatural and psychic connection–a connection which has its own ties to The Thing in strange and mysterious ways. Overall, The Terror not only examines man vs the unforgiving elements of the arctic, but also man vs the supernatural, and perhaps most importantly–man vs man. The reader will soon come to find that the things men do to each other may be far more brutal than any challenges a harsh environment or merciless monster can impose. The Terror has been turned into a TV series and will premiere on AMC on Marach 26, 2018. I am interested to see how faithful this adaptation will be, and if it will delve into the supernatural, spiritual, and mystical aspects as much as the book did.